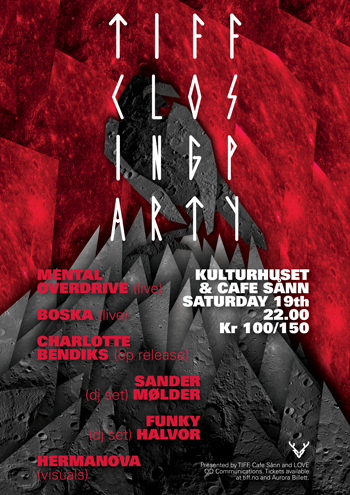 After a series of successful label nights in 2012, Mental Overdrive, Boska, Charlotte Bendiks and Petra Hermanová will team up to fill the main room at the closing party of TIFF 2013 on Saturday January 19th in Tromsø. It’ll be a helluva party, but don’t panic if you can’t make it to into the Arctic this weekend, we will turn up at several occasions around the globe this year. Keep your eyes open!